Aunt Lute Books, 9781879960923, 212pp. Literary Nonfiction. Asian & Asian American Studies. Women's Studies. GOOD GIRLS MARRY DOCTORS is the first anthology that examines "tiger parenting" from the perspective of the daughter. The voices in this volume reveal how a Good Girl is trained to seamlessly blend professional success with the maintenance and reproduction of her family's cultural heritage. Her gratitude for her immigrant parents' sacrifices creates intense pressure to perform and embody the role of the "perfect daughter." Yet, the demand for such perfection can stifle desire, curb curiosity, and make it fraught for a Good Girl to construct her own identity in the face of stern parental opinion. Piyali Bhattacharya is a writer, editor, and writing instructor based in Nashville, TN where she is Writer-in-Residence at Vanderbilt University. Her work has appeared in Ploughshares, The New York Times, The Wall Street Journal, National Geographic, and many other publications. 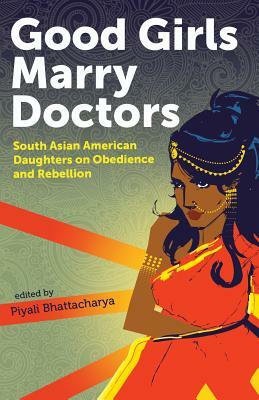 She is the editor of the anthology Good Girls Marry Doctors: South Asian American Daughters on Obedience and Rebellion, which was awarded a grant from the National Endowment for the Arts. She holds an MFA in Fiction from the University of Wisconsin - Madison, and is currently working on her first novel, an excerpt from which won the 2015 Peter Straub Award for Fiction. She can be reached at www.piyalibhattacharya.com.Contributors include: Ankita Rao, Ayesha Mattu, Fawzia Mirza, Hema Sarang-Sieminski, Jabeen Akhtar, Jyothi Natarajan, Leila Khan, Madiha Bhatti, Mathangi Subramanian, Meghna Chandra, Natasha Singh, Nayomi Munaweera, Neelanjana Banerjee, Phiroozeh Romer, Piyali Bhattacharya, Rachna Khatau, Rajpreet Heir, Roksana Badruddoja, Sayantani DasGupta, SJ Sindu, Sona Charaipotra, Surya Kundu, Swati Khurana, Tanzila Ahmed, Tara Dorabji, Tarfia Faizulah, and Triveni Gandhi.